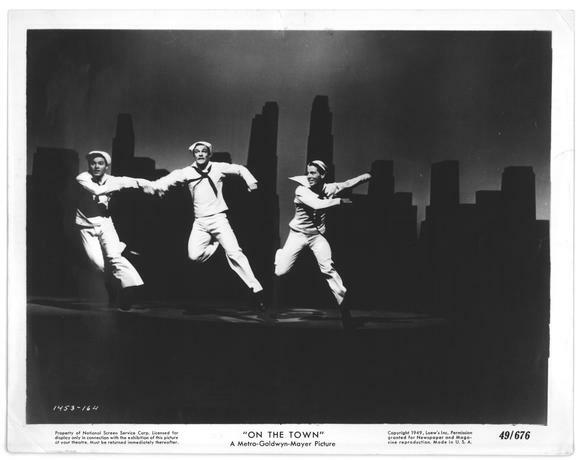 And with these words “On the Town” gets off to a rousing start gliding us through a montage of three sailors on a one day pass seeing the sights of the city, New York City. The Brooklyn Bridge, the Village, Little Italy, Chinatown, the Statue of Liberty, Times Square, Central Park, the Empire State Building and Rockefeller Center. It’s a world wind tour, a sparkling pioneering opening and possibly an early inspiration on music videos. Based on the 1944 hit Broadway musical with music by Leonard Bernstein and lyrics by Betty Comden and Adolph Green. The book, also by Comden and Green, was based on an idea for a ballet called “Fancy Free,” by Jerome Robbins who choreographed the stage production. In 1949, MGM brought the musical to the screen and of course had to change things including dropping most of the original songs and adding new ones (Bernstein’s music was considered too highbrow for movie audiences), this despite the fact that MGM was an investor in the stage production! Only four songs survived and, of those, the opening number had to be “toned down” (the line New York, New York, It’s a hella of town was change to read it’s a wonderful town) to appease the censors and blue noses. Additionally, the storyline was changed, enlarging and focusing more on Gabey (Gene Kelly) and Ivy (Vera Ellen) than Ozzie (Jules Munshin) and Claire (Ann Miller). Then head of MGM, Louis B. Mayer had to be persuaded into to purchasing the film rights because he was repulsed by the show, finding it “smutty and communistic” and furthermore he was offended by a scene where a white sailor danced with a black girl. 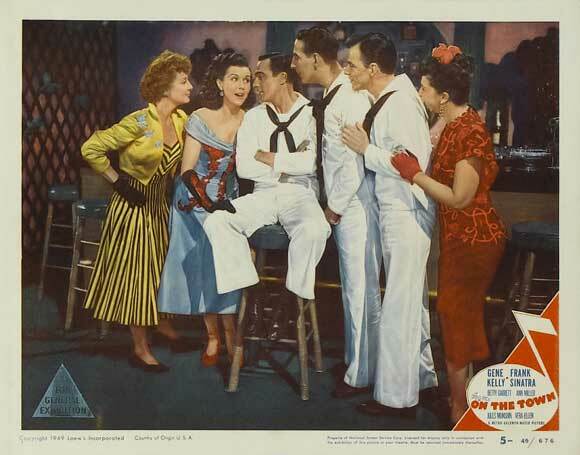 The film is nicely bookended by Bern Hoffman as a construction worker at the Brooklyn Navy Yard singing, an early morning, sleepy version of “I’m Feeling Like I’m Not Out of Bed.” In between there are some spectacular and original musical numbers, directed by Kelly and Stanley Donen and produced by MGM’s guiding light of musicals, producer Arthur Freed. 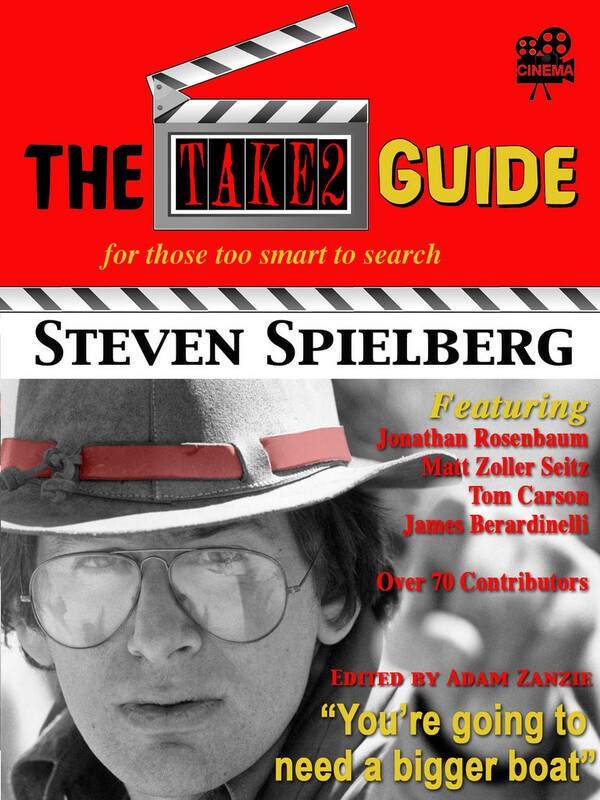 The film was innovative in many respects, most obviously, the location shooting, the first for a musical, and spectacular sights of New York City. The editing of this sequence can be, as previously mentioned, seen as an influence on today’s music videos. Also, two of the female lead characters are fairly straight forward and sexually aggressive when it comes to getting their man and what they want. Some folks who had seen the initial stage production at the time complained about too many of the original songs being dropped from the movie, especially a stunning tune called, “Lonely Town” but, at least for me, and I believe this is true for most of today’s audience who are not familiar with the Broadway musical version, it’s not a problem. 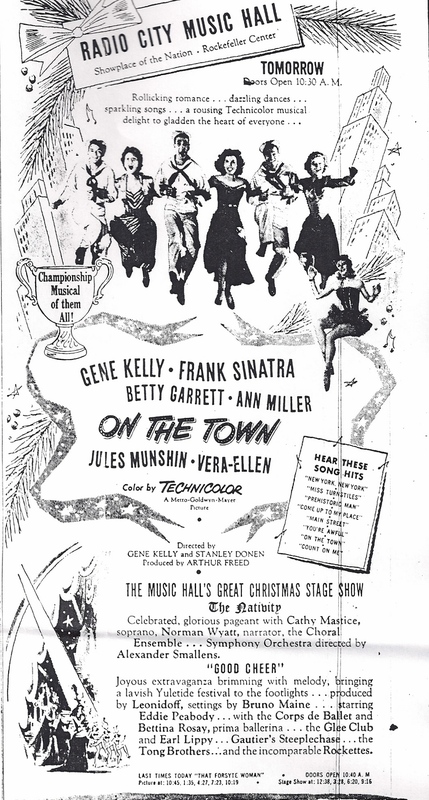 “On the Town” was Radio City Music Hall’s spectacular Christmas attraction for 1949 and I cannot imagine a better holiday treat filled with humor, romance, music and the extraordinary dancing of Gene Kelly, Ann Miller and the rest of the crew. For anyone who saw the film at the time, in such a spectacular venue, it must have been a nice added touch to the holiday season. 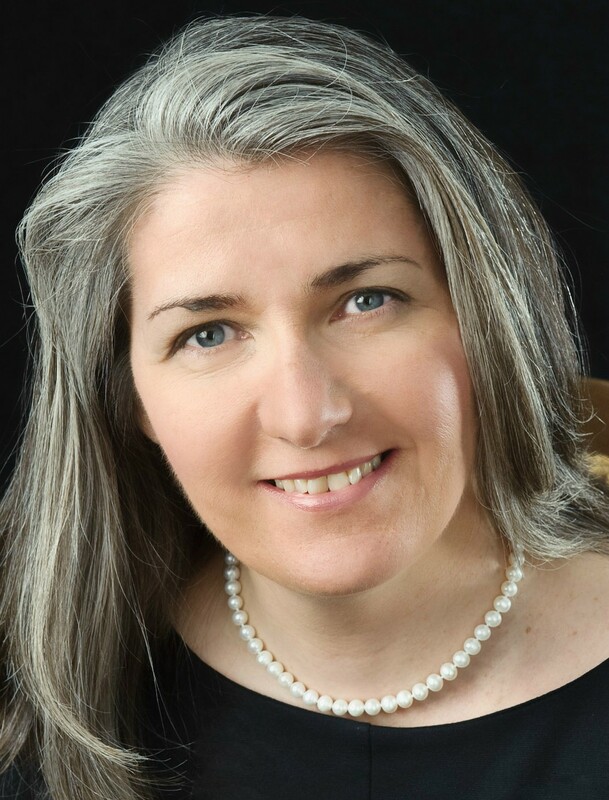 (1) Carol Haney originally had a small role in another Broadway musical, “Pajama Game.” The show’s director, George Abbott liked her performance so much he combined her role with another and came up with the much larger role of Gladys Hotchkiss for which Haney won a Tony. Sadly though, for Haney, about a month into the production she broke her leg. Soon after, Hollywood producer Hal B. Wallis came to see the show, specifically to see Haney only to discover Haney’s understudy took over the role. Her name was Shirley MacLaine who Wallis soon after signed and brought to Hollywood and fame. (2) Alice Pearce was the only member of the original Broadway show to reprise her role in the movie. This review originally was written as part of Wonders in the Dark’s Musical Countdown in October of 2011. 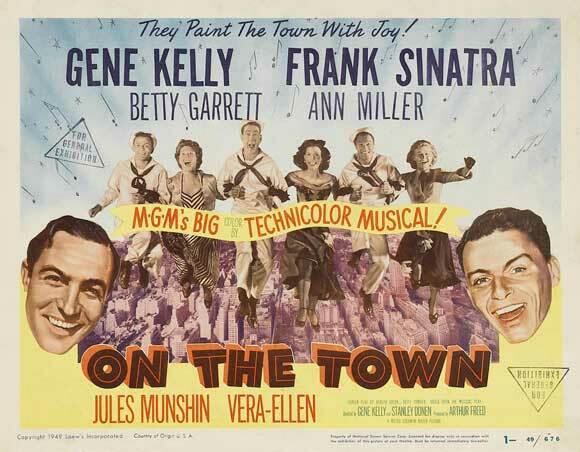 This entry was posted in 1940's, Gene Kelly, Musical and tagged Alice Pearce, Ann Miller, Betty Garrett, Frank Sinatra, Gene Kelly, Jules Munshin, On the Town, Stanley Donen, Vera Ellen. Thanks Eve, one of my favorite musicals also. John, enjoyed revisiting your review of this one. A great film musical – I love the opening with them all walking into the city and the fact that it was made on location does add such a lot. Kelly is wonderful and Ann Miller’s dancing is amazing too. I do have a couple of reservations, one being the treatment of the room-mate, Alice Pearce, which you mention here… annoying not just because it is unkind, but also because it wastes a lot of time. Plus there is also the fact that Sinatra doesn’t get a great song – maybe if they had kept in one or two more of Bernstein’s numbers, one of them would have fitted the bill. But plenty to enjoy! The opening New York, NewYork sequence is beautifully done. I always thought it was too bad the rest of the film was not filmed in New York. The Pearce role is a distraction and she is treated terribly, kinda of the nerdy kid in school who is treated like trash. Why they changed so many songs from the original production I don’t get. The studio bought a musical and then changed it! Strange. John, I’ve just been looking up videos of some of the original Bernstein songs which were dropped from the film, and must say they are fantastic – much better than their replacements imho. I would really like to see a stage production of the show now, or failing that get hold of a cast recording! I do still love the film, but am just gobsmacked by the quality of songs like ‘Lonely Town’, which you mention (this would have been a fabulous film number for Sinatra, who did a wonderful version of it on his album ‘Where Are You’, with some of the lyrics changed), and there’s also a showstopper comic song ‘I Can Cook Too’. A good job the original songs weren’t dropped for ‘West Side Story’! John, as Judy well knows too I was never a big fan of this one, despite the NYC locations, and what would appear to me to be a film right up my proverbial alley. I can’t satisfactorily explain it, except to say that I have always believed Brando was miscast, and Gene Kelly was the answer, and that the Loesser score (loved by so many) has always left me cold. Agreed though on the opening NEW YORK NEW YORK number for a host of reasons. You have me feeling guilty though after reading this marvelous, spirited essay, one in which you make a stellar case. Sam, We all have our likes and dislikes, some which cannot be explained, I know I do. At least, we agree on the opening number. And I assume you mean Sinatra and not Brando. Thanks as always my friend.